Welcome, nerds! 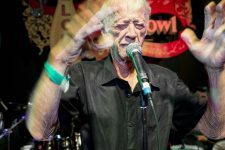 We built this tour for New Orleans music aficionados who want to test their knowledge, and anyone interested in skipping the main attractions for a look at a rockabilly bowling alley, snake dancing by the bayou, or a burlesque show with dyed poodles. The itinerary includes neighborhood bars (Dorothy’s Medallion Lounge, Newton’s & Guitar Joe’s House of Blues), novelties (Poodle’s Patio, Mardi Gras Bowl), and historically significant sites that have faded in the city’s collective memory (Astoria Hotel, The Bop Shop). Urban renewal and the flood following Hurricane Katrina did away with most of these places but their musical legacy lives on, from Rosemont Records’ classic sides to the bounce beats that found their way from Newton’s to national radio hits. Joe Clay performs at the Ponderosa Stomp in New Orleans on October 2, 2015.